Home » Trans Humanism/Tech » “Electronic Tattoo” to Track Your Medical Information; is this a prelude to ‘Mark of the Beast’ ? It sounds like something out of George Orwell’s book 1984, yet scientists have touted it as a major advancement in the field of medicine. Have you heard of the ‘electronic tattoo’ fully equipped with the ability to track patients’ vital signs and report the findings to researchers? The technology is known as an epidermal electronic system (EES), and was developed by an international team of researchers from the United States, China and Singapore. When it comes to microchips, implants, or electronic tattoos—it all sounds a little too futuristic, like these “advances” may be paving the way for government tracking of citizens, or worse. But some industries are promoting these high-tech ideas as major advancements in their field. The medical field is just one place these ideas are gaining a foothold. According to the International Business Times, hospitals and doctors’ offices may one day soon outfit their patients with temporary electronic tattoos. 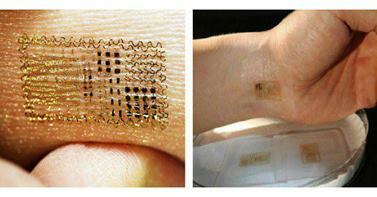 These little skin-patches are said to carry a wealth of information in a tiny space and can reportedly help reduce medical errors while improving care. “Our goal was to develop an electronic technology that could integrate with the skin in a way that is mechanically and physiologically invisible to the user,” says John Rogers with the University of Illinois at Urbana-Champaign. So, invisible electronic tattoos are good? “It’s a technology that blurs the distinction between electronics and biology,” says Rogers in characterizing the patches that allow researchers to track vital signs and more. The devices are small and “nearly weightless”. They are thinner than a human hair and attach to the body using water rather than an adhesive. In that regard, they are very much like temporary tattoos. But unlike the bubblegum tattoos, these have electronic components. Researchers believe they will one day be used in hospitals worldwide. And given the fact that even our animals are implanted with a microchip, the researchers may be right. It isn’t as difficult it seems to convince the people what’s ‘right’ for them. Rather than hooking someone up to a wide range of wires and adhesives, the small patches will give medical professionals all of the vital information they need. In addition, the researchers are working on variations that are voice activated, allowing wearers to operate a voice-activated video game with more than 90-percent accuracy. This aspect could lead you to wonder, if they are able to be voice operated by the wearer, couldn’t they be voice-operated by another controller? “This type of device might provide utility for those who suffer from certain diseases of the larynx. It could also form the basis of a sub-vocal communication capability, suitable for covert or other uses,” said Rogers. The scientists are now working on a better adhesive, without sacrificing the ease of the water application. Their concern is that skin regenerates itself, and a new tattoo would need to be reapplied so as not to lose the old one with soughed away dead skin cells. It seems that this ‘advancement’ has just brought us closer to merging man with machine. Soon, some of us may even be grasping immortality. By seniad in Trans Humanism/Tech on December 21, 2013 .